The FOR-A FA-505 is a multi-channel signal processor providing frame sync and color correction, signal routing and cross-conversion. Color correction is often considered a luxury in the mobile production space, but for broadcast events, it’s a must. 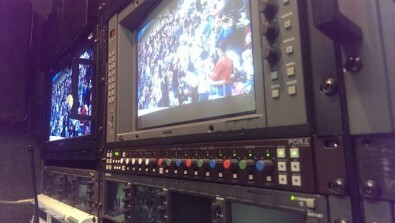 When doing some live events, color correction to give those captured images some extra pop and warmth may be optional. However, color correction is an absolute must for broadcast events, as well as for very large entertainment events. In these instances, we need to have control of the screens and video feeds as we shoot. We cannot take incoming feeds and broadcast them to the viewing audience if we cannot shade and color correct each camera. I’ve found that the FOR-A FA-505 frame synchronizer makes color correction a cinch for mobile production applications. And while the frame sync makes the process easy and the results are high-quality, the frame sync also has a rich feature set. Before launching into the bells and whistles, it’s important to discern the ideal methods of incorporating color correction into the workflow. One option that remains popular is integrating the application into the switcher. Sony is one company that offers this integration, and this is not a bad strategy for mobile production companies that use a fixed, unchanging infrastructure. However, because TNDV customizes the truck infrastructure for each event, that approach won’t work .In addition to our seven trucks, we additionally leverage flypacks across many projects. The FOR-A FA-505 frame synchronizer is equipped with an array of essential functions needed in video production. The multi-channel signal processor provides 5-channel I/O routing for 3G-SDI and HD/SD-SDI signals. Its strength is in frame sync and color correction capabilities. Simply put, our customized approach required an interchangeable color correction system that we could transition between our trucks and flypacks as necessary. If we do not need color correction for a certain project, the compact, plug-and-play nature of the FOR-A solution allows us to easily remove a unit and install it in a different truck or flypack .This helps us tailor the best workflow for each project, with our customers receiving the benefits. In the TNDV trucks, the FA-505's small size makes it convenient to mount, and move, as necessary. As we began shopping for color correction products late last year, it soon became clear that FOR-A had a diverse color correction product portfolio. We were lucky to receive one of the first FA-505 units off the production floor. The primary functions of color correction include the adjustment of red, green and blue levels of any incoming signal. At that point, a quality color corrector will additionally compensate for phasing issues caused by brightness, contrast, and the effects of signal degration by adjusting the black levels (often referred to as black levels pedestal). The FA-505 adroitly handles these important basic tasks, and amplifies the benefits through its multi-channel, multi-purpose architecture. FOR-A bills the FA-505 as providing “extreme connectivity,” and there is merit to that claim when it comes to color correction. External knobs provide a quick and simple means of adjusting for red/green/blue pedestals and more, compared to navigating menus. The more convenient control makes it easier to make changes and adjustments on the fly. However, the device offers more than standard color correction. 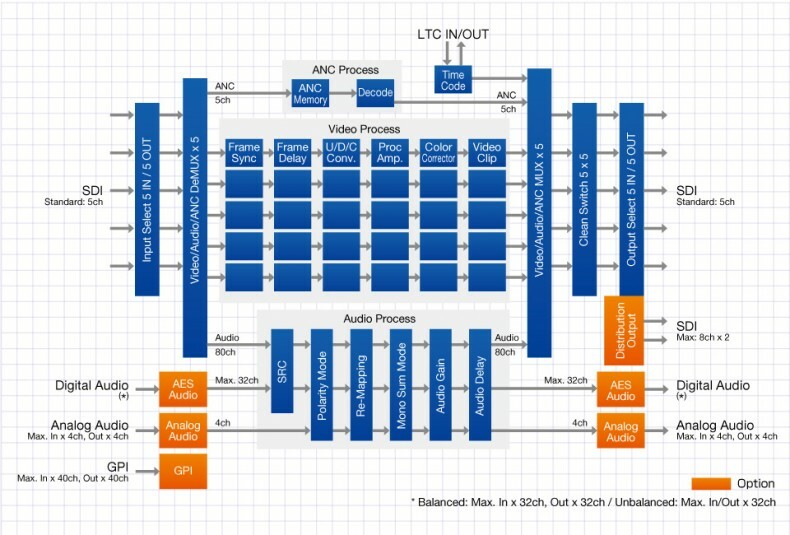 In reality, it is a frame synchronizer that supports routing for five video inputs and five video outputs. 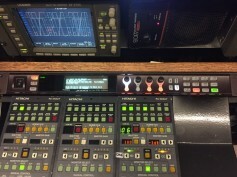 I also handles audio signal processing providing delay adjustments, remapping functionality and sample rate conversion. Up to 80 channels of audio signal can be mapped as standard, or up to 112 channels when optional cards are installed. Delay adjustment and polarity conversion are also available on each channel, allowing systems to be configured without any special audio processing equipment. Up, down and cross conversion for a myriad of video signals per channel provide additional power to the device’s feature list. The FA-10RU remote control manages the FA-505 as well as other FOR-A signal processors. As well rounded as the unit is, the color correction matters most to us – and it certainly delivers the goods. An excellent example is an awards broadcast, for which TNDV is often hired. If the staging happens to include LED screens, plasmas and/or projectors, we need the ability to adjust the color on those screens so that it appears rich and pristine on camera. The color will look washed and inaccurate if you simply shoot a projection screen and take it to air. The point is that cameras interpret color inaccurately. Our task is to examine the live camera feeds and confirm that what’s represented on the screen looks accurate at the acquisition stage. This absolutely requires a reliable color corrector. The FA-505 provides advanced color correction features including; video level, chroma level, black level – spanning -20 to 100 percent – and a full gamut of hue adjustments. This means our production staff is well-prepared to manage and correct color for multiple camera feeds. We additionally purchased several FA-9520 multipurpose signal processors, which provide an additional two channels of processing. This is helpful for larger projects or they are used separately used for more modest applications. This model offers the same quality and a similar feature set (including frame sync and up/down/cross conversion), but on its own is better suited for a smaller shoot at a remote site or facility. The FA-505 provides additional value through its external control features. The external remote unit allows our video shader to achieve camera control, black level compensation, on-stage display control and more from the comfort of a truck’s workstation, with only a keyboard, mouse, joystick and selection of front panel knobs. One final point is unit’s compatibility with external software. We can run these units through out central PC workstations on the trucks and make the typical adjustments we need. We can also easily manage other signal processing tasks, from on-channel frame sync to format conversions. The FA-505's remote control features are easy to interface. Basically all you need is a workstation, keyboard and mouse. In the end, image processing quality is really what matters with color correction. The FOR-A FA-505 makes it easy to achieve, without cutting corners. Add in a quick learning curve – think minutes for standard operation – and it’s difficult to argue that a better solution exists on the market today.